If it’s going to be a Star Wars kind of Halloween or costume party, you can’t party properly without a Death Star pumpkin. 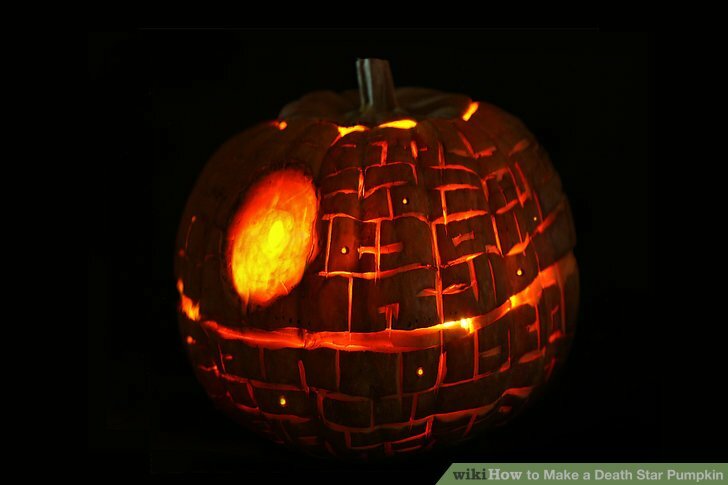 While carving a Death Star into a pumpkin may take some time, you will be the talk of the neighborhood with this bad boy shining in your window. Select your pumpkin. Consider going for the larger sized pumpkin for a more dramatic effect. Gut the pumpkin. Approach this step as you would when carving any other pumpkin. 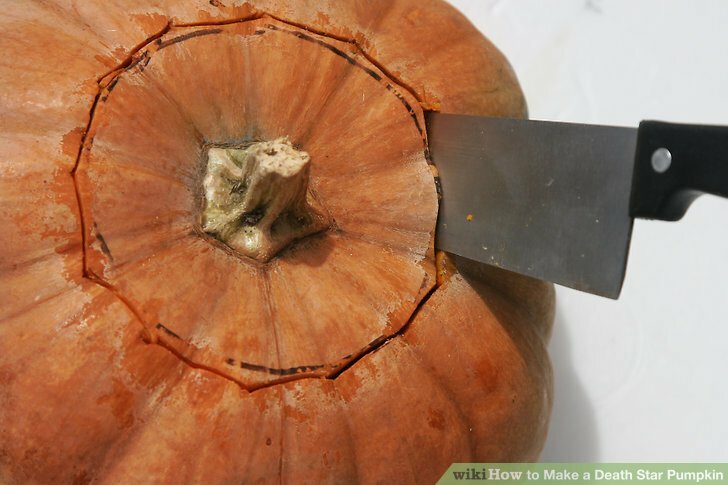 Slice off the top using a sharp knife and remove the insides and seeds of the pumpkin. Gather supplies. Pick up a store-bought pumpkin light bright kit that will allow you to illuminate the pumpkin with small colored (or clear) lights that illuminate off the candle or battery operated flashlight. Get typical pumpkin carving tools including sharp knives in different sizes and a small shovel that you can use for s****ing the insides of the pumpkin. Also, a clay loop tool (available at most craft stores) will be vital to creating the lines. 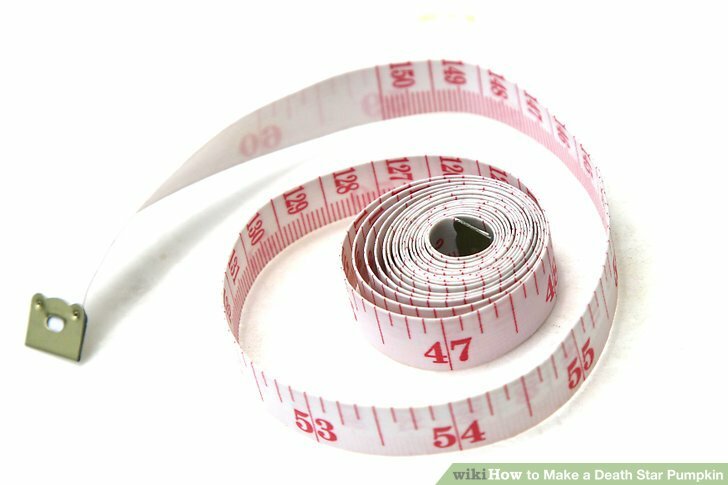 Find a sewing tape measure. The tape measure will be a very important part to making this design work so make sure you don't leave this supply out. You should also grab a pencil to trace lines on the pumpkin. Create the middle part of the star. 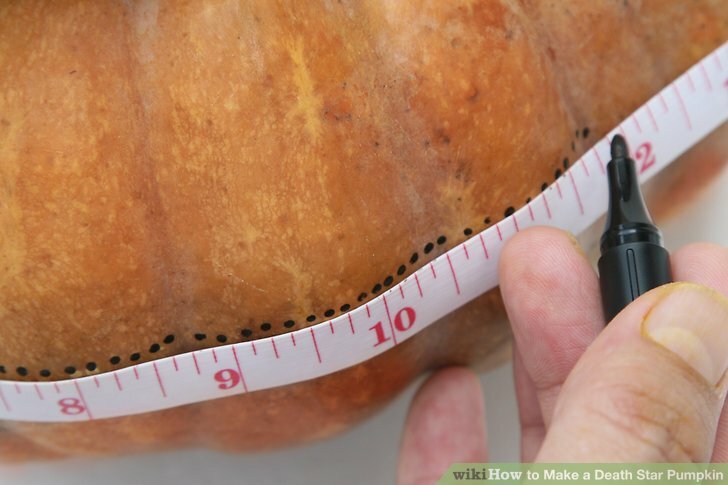 Wrap your tape measure around the middle of the pumpkin and mark your lines. 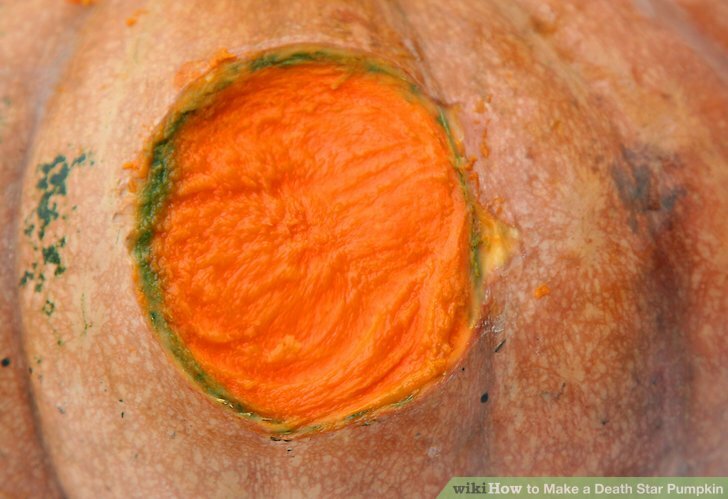 Use the clay loop tool to gouge out the center circle around the middle of the pumpkin. 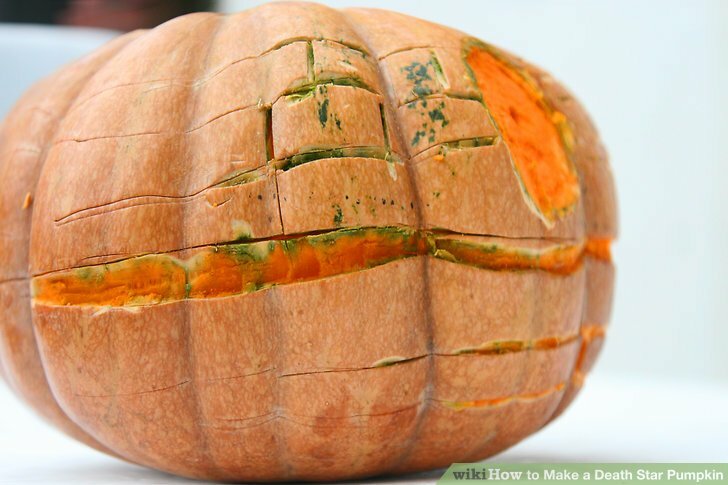 Don’t cut all the way through the pumpkin skin, but make an impression around the center. Design the horizontal lines on the pumpkin. Use your tape measure to mark lines along the pumpkin veins. 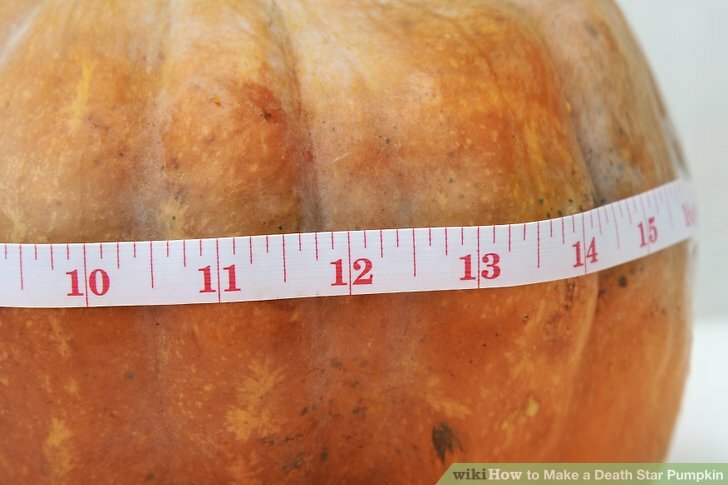 You will need to create specific measurements all the way around the pumpkin. Keep measurements in proportion to the size of the pumpkin. For example, a 77-pound pumpkin you could make a 2 ½ inch mark above and below the middle impression you just made around the pumpkin center. Create the laser circle. 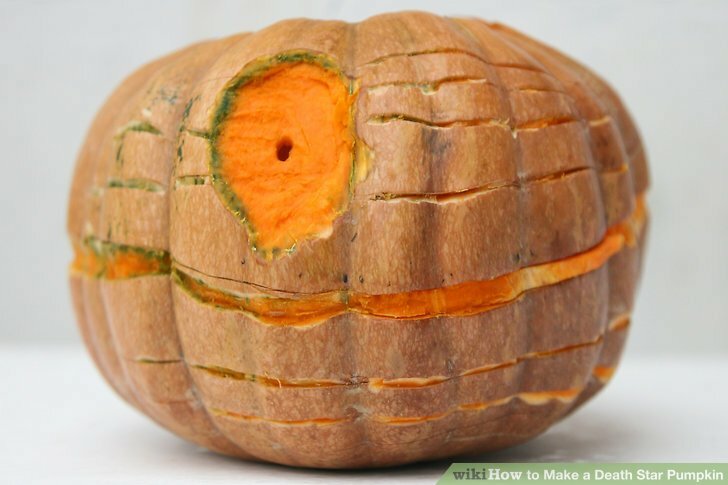 Choose a space between the veins and the upper part of the pumpkin for the laser circle/hole. The circle should be at least an inch above the horizontal line. Consider using a teacup bottom to trace the circle. Use a knife to create an indent around the perimeter of the circle to mark it in place. 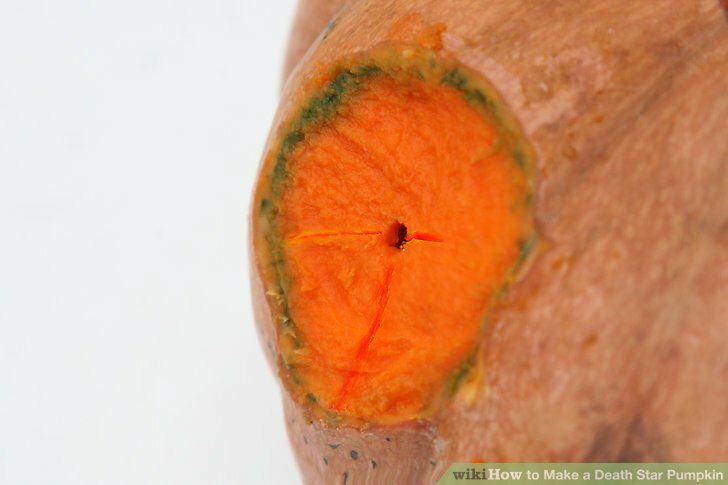 Place a hole in the middle of the circle with a pencil mark and then use a small knife to dig a larger hole (but not much bigger than a pen tip). 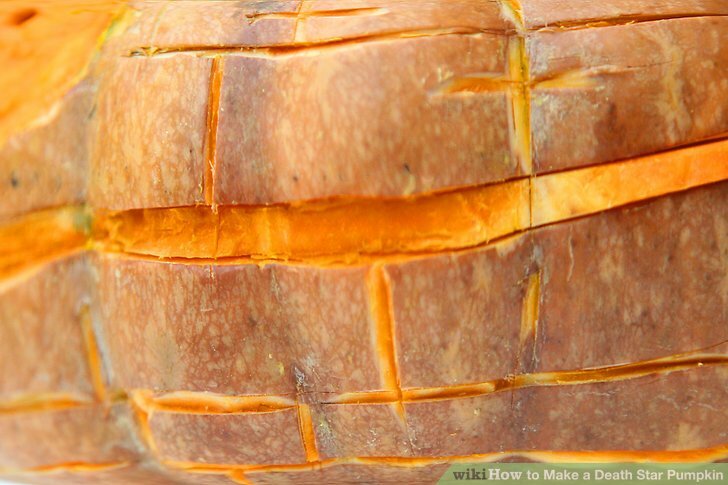 Carve horizontal lines around the entire pumpkin. You made pencil marks earlier to use as your guide. Use a thin clay loop tool or knife to gouge out the horizontal lines. Follow the pencil markings to keep lines symmetrical. As you cut the lines, avoid cutting into the laser circle. You will need that circle to be surrounded with clean lines. 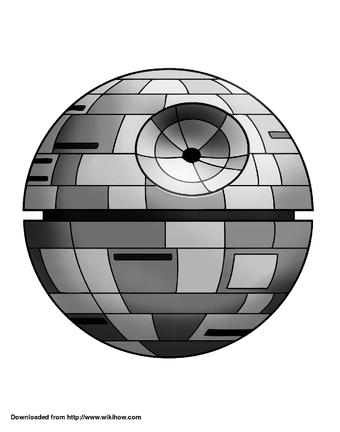 Re-emphasize the centerline of the Death Star. Use the flat clay loop tool to go over the line, deepening and smoothing the line. Widen the fourth horizontal lines using your clay loop tool. Depending on the pumpkin size you may want to re-assess where to create this wider line. Don't make it as wide as the middle line, but wider than the rest. Carve out boxes. 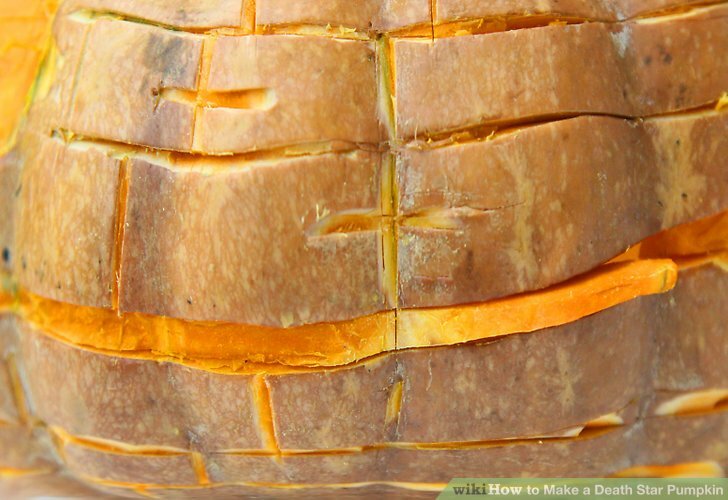 Make small vertical cuts every around the pumpkin. Start at the top and work your way around and then downward. 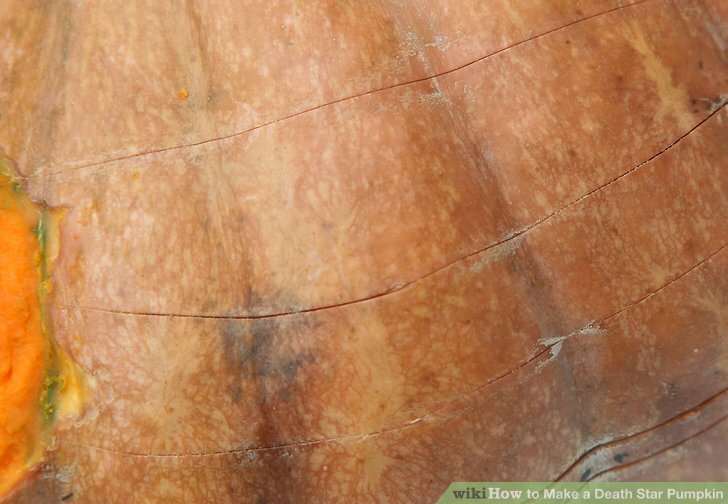 Make sure the vertical lines are parallel to the pumpkin veins too. Avoid carving boxes over the laser circle. Deepen box lines after you’ve created the initial vertical lines using the clay loop tool. Again, you don’t want the box lines to be as thick as the midline but large enough to be seen from a distance. 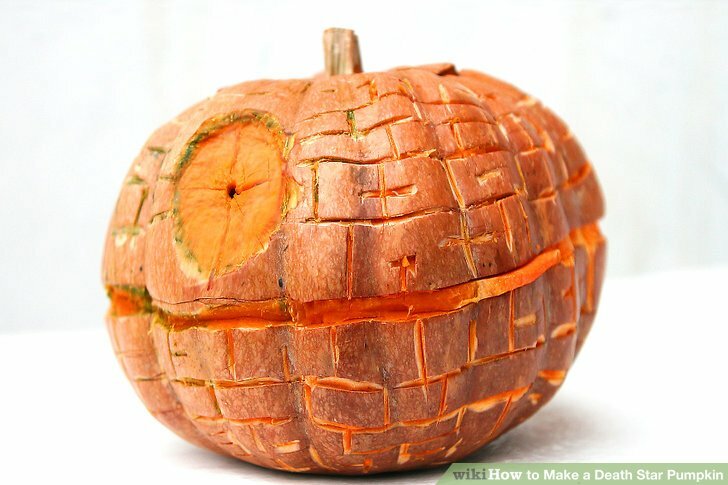 Customize the Death Star by carving out different sized geometric rectangular shapes throughout the pumpkin. Use the clay loop tool as you will need to remove the pumpkin flesh to distinguish the rectangles from the rest of the pumpkin. Carve out the laser circle. If you have a round drill bit you can use that to create a smooth surface. Otherwise, carve the circle with the clay loop tool. 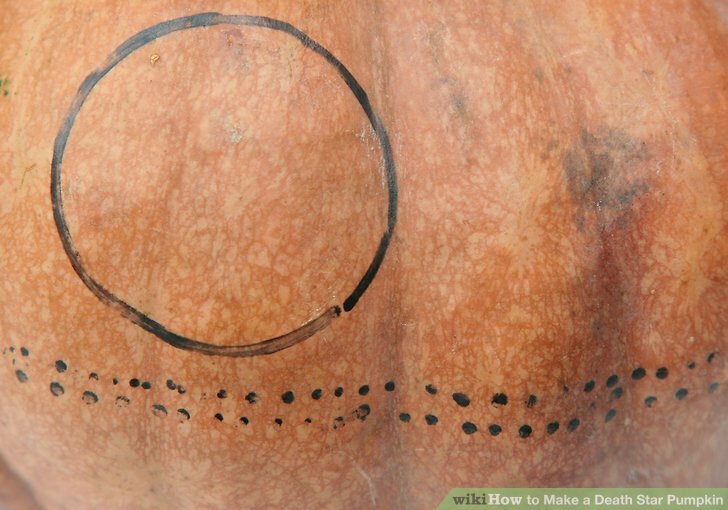 Hollow out the laser circle and create a smaller circle that goes all the way through the pumpkin. The center circle you created earlier will be your guide. Be careful not to make this circle too large, but large enough so light can shine through. Add finishing touches. These small touches will make all the difference in the world so don’t skip this step. Pepper the exterior of the pumpkin with the pumpkin light brites. Once the candle or flashlight has been lit inside the light will illuminate the light brights so select places that you want to sparkle or shine. 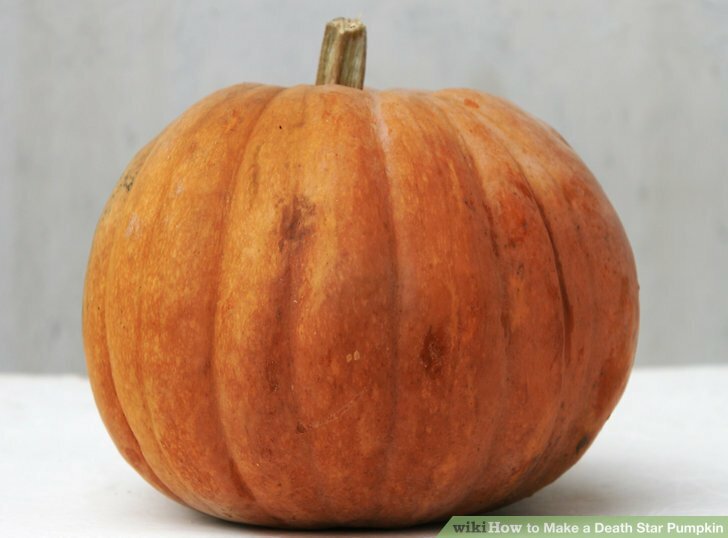 Add a flashlight or candle inside the pumpkin. If you plan to leave the pumpkin unattended, opt for a battery operated flashlight or battery-powered candle for safety. To use this template, print it out and tape it to your pumpkin wherever it fits best. Try to pick a surface that is relatively free of blemishes, if possible. 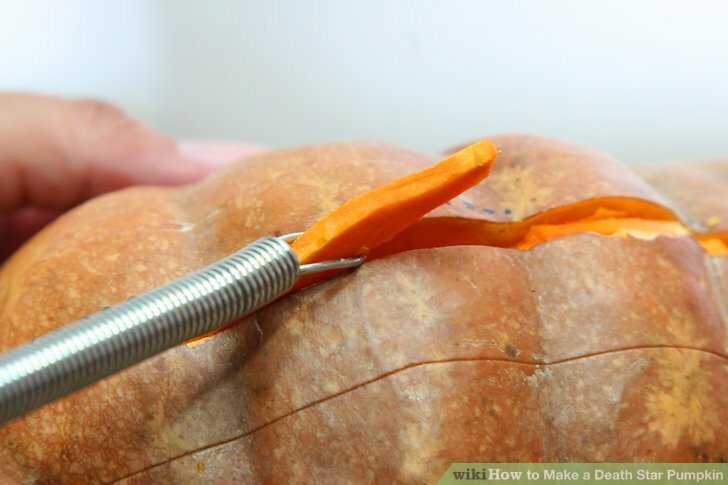 Then, use a sharp, narrow implement like a toothpick to poke holes through the paper and create a guide that will help you carve your pumpkin. If you make a mistake carving (and perhaps carve too much), keep a tube of glue stick handy. You can always put the pumpkin back together with the glue. 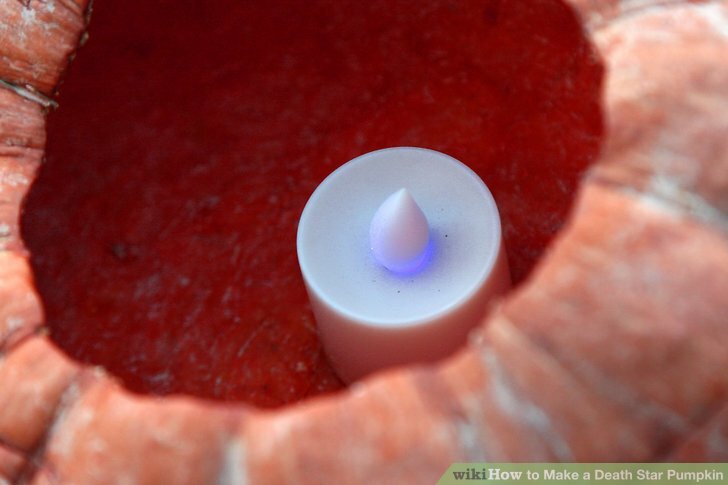 Consider using a different colored bulb to illuminate the pumpkin. For an extra eerie effect, try a purple or green bulb.